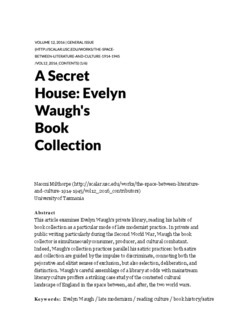 This article examines Evelyn Waugh’s private library, reading his habits of book collection as a particular mode of late modernist practice. In private and public writing particularly during the Second World War, Waugh the book collector is simultaneously consumer, producer, and cultural combatant. Indeed, Waugh’s collection practices parallel his satiric practices: both satire and collection are guided by the impulse to discriminate, connoting both the pejorative and elitist senses of exclusion, but also selection, deliberation, and distinction. Waugh’s careful assemblage of a library at odds with mainstream literary culture proffers a striking case study of the contested cultural landscape of England in the space between, and after, the two world wars.